This entry was posted in Fashion, Illustration. Bookmark the permalink. thanks for posting her work. gorgeous! makes me want to be a fashionista! where are you finding all these great illustrators lately? Absolutely stunning. I love fashion illustration. these are just gorgeous. thanks for the link. fantastic style!! 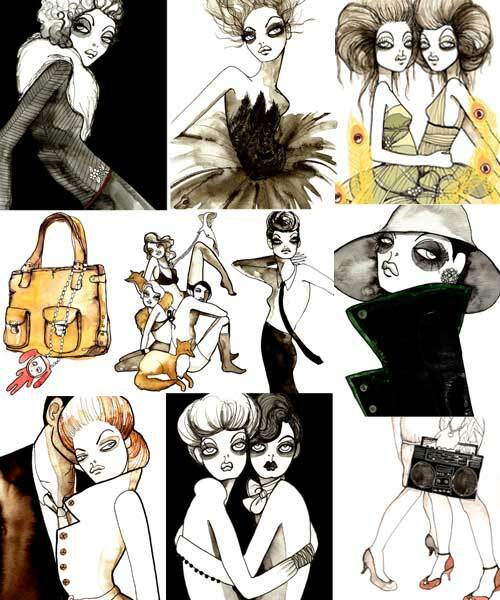 love fashion inspired illos! Why do I feel like my eye make-up technique is being mocked? heheheh. xxoxoxo. Love them! Fantastic illustration! I LOVE IT! i am opening an ebay store as well as an online boutique – i am IN LOVE with your illustrations. i am very interested in your graphics and pricing.